Whoops! In an official Halo Wars email sent to retailers and games press in New Zealand today, Microsoft make official mention of the rumoured red Xbox 360 Elite console. The email was to announce a deal whereby anyone buying a 360 console in NZ would, for a limited time, receive a free copy of Halo Wars. Good deal! Except, there's a catch. You'll get the game if you buy an Arcade, Pro or Elite model, but "this Halo Wars offer does not apply to the Red Xbox 360 Elite console which is exclusive to EB games." Cat's out of the bag now, Microsoft. May as well release those official pics, satisfy our curiosity as to the machine's hue. Auckland, New Zealand – 19 February 2009 – Buy a new Xbox 360 console and for a limited time we'll throw in a copy of Halo Wars*. · Halo Wars launches 26 February 2009. · Promotion valid 26 February 2009 – 26 March 2009 while stocks last. * Xbox 360 Halo Wars Standard Edition, $99.95 RRP. This Halo Wars offer does not apply to the Red Xbox 360 Elite console which is exclusive to EB games. Halo Wars is a strategy game based on the legendary Halo universe. Command armies of UNSC units, both familiar and new, in their initial encounter against the Covenant, an alien coalition threatening to obliterate mankind. Experience an early period of the storied Halo universe, in a time leading up to the first Halo game. With the guidance of Serina, a spirited A.I. persona, direct legions of UNSC soldiers, Warthogs and Scorpions against Covenant Grunts, Elites, Ghosts and Scarabs, each group having its own strengths and uses in battle. Strategic-minded players who react well under pressure will emerge victorious. 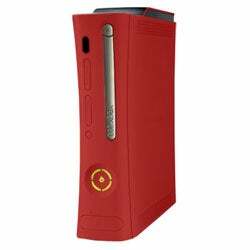 Xbox 360 is a premier video game and entertainment system. It is home to the best and broadest games. The digital center of the living room, Xbox 360 blends unbeatable content, including personal pictures and music, with a unified online social network to create an entertainment experience that can be shared at home or across the globe. More information can be found online at http://www.xbox.com/xbox360.